Phizz-whizzing new branding for the world’s No.1 storyteller, Roald Dahl! Exciting, bold and instantly recognisable with Quentin Blake’s inimitable artwork. Matilda Wormwood’s father thinks she’s a little scab. Matilda’s mother spends all afternoon playing bingo. So all these grown-ups had better watch out, because Matilda is going to teach them a lesson they’ll never forget. 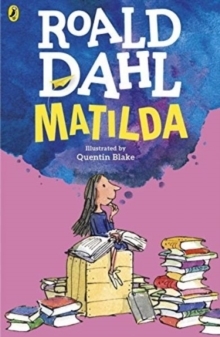 “A true genius…Roald Dahl is my hero”. (David Walliams).